Trust in the power of reciprocity. Back when I was selling tours outside of the Colosseum, before I was even a guide, I saw a guide having some issues with her group. I had seen her around before and knew she was pretty experienced. Her group was giving her a hard time since they had bought Roma passes that allow access to the top sites of Rome, including the Colosseum. However, she had already bought Colosseum tickets for them, so she knew she was about to lose out on about €100. I approached her and told her that I would sell the tickets for her and give her all of her money back. I sold all of her tickets within ten minutes and we started to form a relationship. Turns out, she was a well-known guide (Francesca Caruso) who was connected to Rick Steves. You never know who you’re going to meet. Selling those tickets not only earned me a connection to an expert tour guide, but also landed The Roman Guy in Rick Steves’ Europe. Aspart of my series about prominent entrepreneurs and executives that overcame adversity to achieve great success, I had the pleasure of interviewing Sean P. Finelli. Sean is the CEO of The Tour Guy, a new brand that has evolved from a suite of tour operators including The Roman Guy and The Paris Guy. In 2008, Finelli left a Wall Street career behind to trace his cultural roots back to Italy. Since then, Finelli has created a travel company that excels at digital marketing and ecommerce, while still allows the buyer to be and feel human with their dedication to traditional customer service. Sean P. Finelli: I left for Italy directly from my last final exam in college. Literally. I get up from my desk and drove to the airport as soon as I’d finished taking my exam. That’s how badly I wanted to live in Italy. I grew up in an Italian-American family. However, I didn’t grow up going to Italy every summer or speaking the language, so there was always this looming disconnect between myself and my culture . I did always feel connected to numbers though, and that’s why I ended up studying finance in college. It was actually while interning on Wall Street that I felt my priorities change. Numbers weren’t enough. I needed to do something with a more personal meaning. I was pretty naive at the time. I figured I’d move to Italy to learn more about my family and culture, and somehow land a job. Little did I know that I couldn’t just get a job in Italy with the snap of a finger and flash of my economics degree. After some odd jobs and promotion work, I noticed there was a gap in the tourism market. I had to wade my way through herds of tour groups under the hot sun every time I approached the Colosseum. No way did I envy those visitors and no way was I going to allow my parents to go on a similar experience when they came to visit. I wondered if anyone actually asks to tour the Vatican at the busiest time of day with a group of 30 people. They had spent their time, money and emotional energy earning this vacation to Rome, surely visitors would prefer early access, skip the line tours and smaller groups. That’s how I began to create a business model. I got to work finding out what people want, and figured out what I could do to provide that. 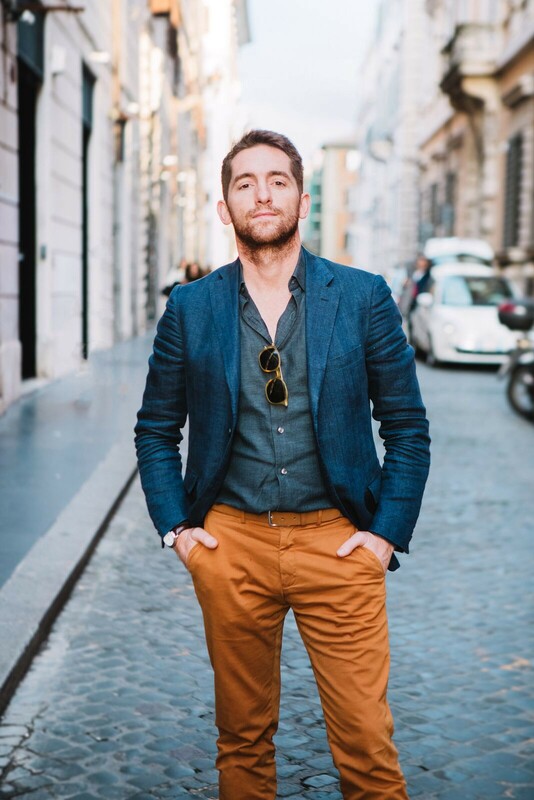 Fanelli: My initial months of living in Italy were my “darkest days.” But I’d come this far, I’d left the big fancy New York career opportunities behind and failure was not an option. For a while, I would stand outside of the Colosseum seven days a week panhandling tours. Sometimes I’d ask for money, and other times, I would only work for tips. Anything to get my foot in the door. The problem was, a lot of guys were doing the same thing. I was proud of what I did, and in some ways, the pride began to get in the way. We started to get competitive with each other, which escalated into violence. In a sense, we would find ourselves in “turf wars,” fighting over business, clients, you name it. I even had a boss who threatened to beat me in front of a crowd of people. For a few nights in the early days, I slept in a train station because I had nowhere else to go. Money was tight. At the time though, I didn’t even see this as a challenge; all I saw was an opportunity to work more. Finelli: Getting my Italian passport and really becoming Italian is always a memory I wistfully look back on. After moving to a new country and not knowing the language, not having a job, and doing whatever I could do to scrape by, I somehow assimilated. I did end up learning the language and getting a job. I lived like a real local. After I dipped my toes in the water of the tourism business, I was making money. Not a lot, but enough to pay bills and travel when I wasn’t working. To this day, I always say that adversity is a good thing. It teaches you what you’re able to withstand and shows you that you’re stronger than you think. When I moved to Italy, I had nothing and no one. I pushed myself to rise from my circumstances and work as much as I could to get to the next level. Finelli: I’m sure many people answer this the same way. I worked a ton and was incredibly driven by my career. Even today, our yearly business goal is to laugh at how small we were 12 months ago. How we were generating a fraction of the revenue we currently bring in, or how small the office was. When I was living in Rome, I wanted to work as hard as I could to grow as a business person. There was one day specifically that led me to the next chapter. Someone asked me if I could give them a tour of the Vatican, and I immediately just said yes. At the time, I had never even been inside of the Vatican. I just said yes to anything a potential client wanted from me, no questions asked. I spent the next 48 hours learning everything there is to know about the Vatican. I learned the art history, the cultural history, the layout of the museums, everything. From there, I was able to not just sell tours for other people, but be a tour guide as well. That’s when I started to call myself “The Roman Guy” and it stuck. I also met really amazing people along the way. I had friends who supported me, who I could laugh with at the end of the day. But I also met wonderful people who wanted to take tours with me. They would give me decent money to help them see the best sites in Rome, or even drive them to lesser-known attractions and towns. They’d refer me to their friends, who would then refer me to their friends, and so on. My brother built me my first website, and in 2012, my business partner Brandon came along. I was the finance guy and he was the salesman. And ever since, our business has doubled in revenue every year. 1. Own your role and never think you are above what you are doing. In college, I had two jobs. One of them was waiting tables, and the other was working at a prominent finance firm, making good money. If people asked what I did, I’d only mention the waiting tables part. You will get much further in life when trying to relate to people, rather than trying to feel superior to them. People want to help you and work with you if they can relate to you or teach you something. 2. Trust in the power of reciprocity. Back when I was selling tours outside of the Colosseum, before I was even a guide, I saw a guide having some issues with her group. I had seen her around before and knew she was pretty experienced. Her group was giving her a hard time since they had bought Roma passes that allow access to the top sites of Rome, including the Colosseum. However, she had already bought Colosseum tickets for them, so she knew she was about to lose out on about €100. I approached her and told her that I would sell the tickets for her and give her all of her money back. I sold all of her tickets within ten minutes and we started to form a relationship. Turns out, she was a well-known guide (Francesca Caruso) who was connected to Rick Steves. You never know who you’re going to meet. Selling those tickets not only earned me a connection to an expert tour guide, but also landed The Roman Guy in Rick Steves’ Europe. 3. Have no faith in the naysayers. If you believe in something and have a good reason to believe in it, then do it. Make decisions based on data and market research. If you see an opportunity that may sound unusual but has great potential to grow your business, run the numbers. As long as you can back your decisions with data, go for it. Finelli: Back when I was making money off of showing people around Italy, I met a very nice client named Scott Duman. Scott was on vacation in Italy and asked if I could take him around, show him the sites and even drive him to the Amalfi Coast one day. We ended up bonding, and we stayed in touch even after his trip. There were plenty of times while I was living in Italy when I figured I should just move back to the US and get a real job with a more steady income. Every single time I planned to come home, the phone would ring. And more likely than not, it was a friend of Scott’s calling to see if I could show their group around Italy on their upcoming trip. Scott has since referred me tons of business. When I ask him why he decided to help me so much, he always tells me that in his younger days, there was someone who believed in him and helped him grow his career, and now, he’s repaying the favor. Now with my entire team, I hope I can help each one of them learn and provide them with skills they can use for the rest of their lives. Finelli: For 10 years, The Roman Guy was my only company. We sold small group tours in Italy that offered exclusive access to restricted areas and skip the line tickets. In the last year, we have added The Paris Guy into the mix, which expands our services to France. We also added Finelli & Shaw, a luxury vacation planning service that will coordinate any and all details of your vacation. 2019 is bringing you The Tour Guy, the parent of all of these brands. With The Tour Guy, we are one unified team with a diverse set of products. We’re working now to develop The Tour Guy brand and integrate our existing brands into this exciting new project. With this site, we also hope to design state-of-the-art user experience tools to make for the easiest selection and buying process. Finelli: The first thing that comes to mind is to be honest with the customer. Get to know people on a personal level so you can understand how your product can benefit them. I always ask my sales team to go for the “second question.” That doesn’t just mean asking more questions about their upcoming travel plans. I always encourage my team to ask clients what they do for a living, what they enjoy doing in their free time, if they have kids, etc. Understanding your client is the absolute best way to figure out how we can help them. And, if we can’t help them with their travel needs, there’s no shame in referring them to someone who can. Be a trusted resource to clients, not just a business opportunity. Finelli: Adversity is good for all of us. Having tough days now will help you have the strength to get through struggles later in life. Oh, and if you’re planning a trip to Italy or Paris, or are ever looking to work in a dynamic travel-tech atmosphere, reach out to us. Finelli: You can follow me on Instagram at @seanpfinelli.